There are safety codes that must be followed when dealing with cable installations and physical fire barriers (firewalls). Fire stopping rated firewalls after cable installations should be taken seriously. Today, these codes are more important than ever. An average business will deal with five or more cable installation companies that will penetrate the building’s firewalls. Most commercial buildings have connectivity that requires cabling from a ‘low voltage’ cable installer. This means that cable TV, intercom, security, computer network, and telephone installers can, in most states, with or without a business license, install low voltage cables. Without training or certification requirements, the chance of a firewall violation tends to increase. When the inspector returns, he is usually MAD as —-. Most low voltage cable installers are ill-prepared to deal with firewall penetrations at the time they are encountered. For the sake of convenience, installers will look for a hole created by a previous installer and run the cable through. Then the installer hopes that the violation either won’t be noticed or will be graciously overlooked. When caught, the standard “but I only used a hole that was already there” line will only agitate an already frustrated fire marshal or inspector. Heads will roll if you can’t offer a solution. Typically, if the installation works the cabling is forgotten and everyone is happy. However, it’s really in your best interest to do a little inspection behind the scenes. EIA-TIA 568 covers all of the specifications for attachments, bend radius and separation from EMI (as well as all other common specs), all of which are important. Like the foundation of a building, it’s what is behind the scene that matters most. A combination of infractions could affect a computer network’s speed or cause interference, resulting in intermittent problems. Failure to properly reseal a firewall could be your biggest problem. Building inspectors and fire marshals will shut you down for the removal of cables found in violation of a firewall. It all boils down to this: without licensing, permits, and inspections, violations will continue. I had been in the data cabling business for over 20 years. Our small company had twenty installation crews, and most of them were faced with firewalls every day. We learned about the importance of sleeving and sealing fire walls as a third party, in a showdown between an inspector and a hospital. The hospital had until ‘high noon’ on the third day to correct firewall violations made by their previous installation contractors. The cables in question happened to be the fiber optic backbone for the local area network. These cables ran the emergency room, intensive care, and hospital administration, to name just a few of the affected departments. Removal, sleeving, and reinstallation was not only impractical, but impossible if the hospital was to continue to function. Panic was setting in for us and the new contractor as well as for the hospital. While the crisis team focused on the logistics of moving patients and acquiring temporary connections for the retrofit, we took a different approach. It was clear that the inspector wanted metallic conduit to be installed ‘through’ the wall and sealed at entry and exit. Our first reaction was to approach fire stop experts. We looked at pillows, putty, caulk, and other kinds of expensive solutions, all of which stopped short of our needs. What we needed was a ‘split sleeve’. Rather than waste more time trying to find a ready-made solution, we decided to create our own. We took a two-inch aluminum conduit, threaded, cut it in half down its axis and placed it around the cables and through the firewall. A pair of slotted square washers was worked over the cables and caulked to each side of the firewall with the slots inverted 180 degrees from each other. A two-inch coupler was then slotted and screwed down the sleeve. The procedure was repeated for the other side of the firewall. With a little caulk behind the washers and some putty stuffed in the split sleeve around the cable, the hospital’s firewall passed inspection. Once we had a metallic conduit installed around the cables, the inspector, the crisis team, and a very weary (but happy) hospital administration went home. We went back to the drawing board. A patent was initiated, and after a survey of inspectors, we were convinced that our Split Sleeve Firestop System would effectively solve the problem of critical cable removal due to the installer violating the barrier. 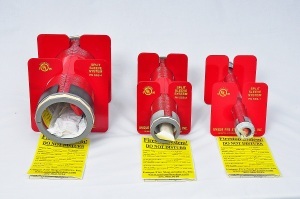 A patent on the System was awarded and UL has it listed in its Fire Resistance Directory.